We took our last family swim this past weekend. More than the season is changing. My sixteen-year-old drove the four miles from our home to Simpson Point. His recently teened sister was the first to test the water. At high tide the islands float in a vast blue expanse, but at low tide there is a sea of sticky mud. During the summer, I check the tides daily with the weather, adjusting our rhythms to the pull of the moon and the sun. We are not unlike the herons, except they prefer low tide. Sometimes I follow the birds with my paintbrushes. Too soon they will migrate south. September light draws a sharp line between ocean and sky. The children return to school, and my view is now a blank wall. To write a novel, I look inside. I see the Atlantic from the opposite shore. My imaginary England is vivid, drawn from memories of our year abroad. Writing is not that different from painting. First I block out the major elements in washes of pigment. Then I sketch out the plot and place the characters in the landscape. The space between them is as important as their forms. Word by word, I fill in the details and lift the excess with a sponge. The one color I cannot lift is blood red; it stains the page. My characters take a life of their own, and I follow the narrative tide. Political Watch: soon the Brunswick Town Council will be considering a proposal to open Simpson Point to clamming. The airboats can be hazardous to swimmers and to kayakers. Also clamming muddies the water. Please urge your council members to restrict clamming at Simpson Point during the summer. Simpson Point is the only public access point to ocean swimming in Brunswick. Your painting is so vivid, so real. I loved it. Many thanks. Wish you luck with that 'lifting'. Hi Sarah, I enjoyed your comparison of creating a novel to creating a painting. 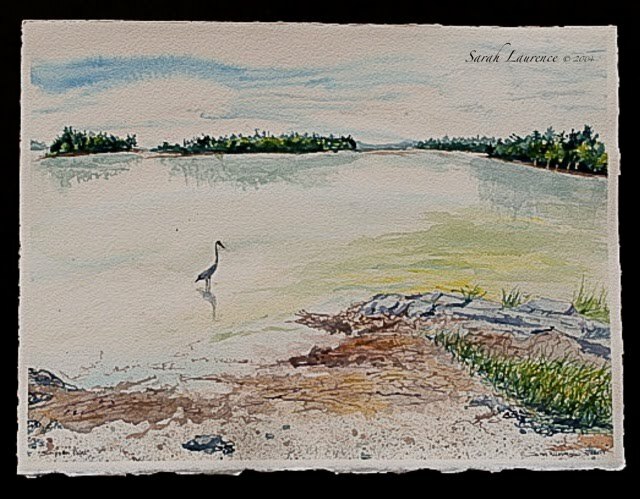 The Great Blue Heron watercolor is lovely. I hope that proposal is squashed by the town council. Capitalist claims to land and ocean must be challenged. It's exciting to see our children grow and assume more and more adult responsibilities. Your paintings are so beautiful. I could see you making quite a good living at that! Sarah, I recently wrote a post about how visual artists have a lot to offer writers in the ways they are able to see the world and how so many of my writer friends are painters as well. One of the people I was thinking of was you--so I loved the way you wrote about writing as if you were crating a painting. Lovely. Love the painting and I wish your town much luck with the proposal and that it will be struck down. Dear Sarah, Once again a wonderful looking seascape which is linked to the change of season which in turn leads on to the drafting out of a storyline for a novel. This I found particularly interesting and fascinating but a process which is not, I imagine, as many believe, easy. I love the analogy between watercolor and writing. Lovely and real, as is the entire post. Gorgeous. In the photo, I love the blue of her shirt against the blue of the water and the blue of the sky! So pretty. And, your painting ... stunning as always! Wonderful comparison. Wonderfully impressionistic, and bit mysterious, too -- like all creative processes. 58 degrees here today, with a nippy wind! no more swimming, for sure. I was much struck by the idea of your teenage driver. The wheel has turned in a big way for him. I love it when you showcase your beautiful paintings! Dibaker, welcome to my blog and thank you. ACIL, I can’t believe my son is driving – it feels like I only just taught him how to ride a bike. Bonnie, I’m happy to share the ocean with the clammers offseason. It’s the airboats in the summer that are problematic. Tina, I wish I could make a “good” living painting watercolors, but it’s not the most lucrative profession, especially in this economy. Still, the spiritual payoffs are huge. Cynthia, what’s the link to your post on art and writing? Tracy, my hope is a modification of the proposal for multiple use: swimming and kayaking in the summer and clamming during the rest of the year. Edith, thanks for following all my threads. Both painting and writing are challenging but rewarding. Tricia, that’s good to hear from another writer. Kelly, that’s exactly what I said to my daughter. She seemed part of the landscape, almost like a figurehead on a ship. Bee, it’s not swimming weather here either. We are waiting another year before he gets a driver’s license, plenty of time to practice. I freak out looking at the accident stats, but he’s a cautious driver. Here you go, Sarah! Thanks for asking. Cynthia thanks for the link to your related post. Here’s the hyperlink. I’ll send you an email with the code to make hotlinks in comments. Oh my goodness. Your sixteen year old at the wheel. You are blessed he is a levelheaded guy with good map skills, Sarah! Beautiful painting, fitting for the end of Summer. My characters take a life of their own, and I follow the narrative tide. and good luck with the new driver! I don't know. I think writing must be much harder than painting. I wish I could write and I wish I could sing. I stand a better chance of writing than singing, but not by much! JAPRA, yes, the map skills will be handy, but I’m not ready to let him drive off on his own yet. Amanda, it’s good to hear that this post was helpful. Carol, thank you! A town councilor assured me that they will seriously consider the Simpson Point issue. The town manager is under the impression that only seasonal access for clamming was being considered, but he wasn’t sure of the specifics. Fingers crossed. Elenka, I find writing and art challenging for different reasons. I too lack musical skills. The comparison between painting and writing is very insightful - thank you! Lovely painting and your painting with words. You have been blessed with a wonderful talent for both. Loved your mention of blood red. Booksnyc, this morning I edited a chapter and then spent the afternoon painting. I’m using 2 different cerebral hemispheres, but it’s the same brain. Troutbirder, I’m not savoring so much as gnawing on this one! Rose, sometimes I think life would be simpler if I had only one passion, but I’m happier doing both. Elizabeth, that’s fabulous to hear that you’re back to art! Give it time to work off the rust. One watercolor trick on red is to use it first and then cover it with masking fluid so it doesn’t bleed into the other colors. I did that today with a sailboat hull. It pops. Such a pretty water colour of such a wonderful place. It is a pity that a place like that cannot be left alone, forever man interfering with its beauty sooner or later. I enjoyed the post on the island also - there is nothing so nice than arriving on an island by boat and no other transport available. We have many islands at Loosdrecht, but they are new land and tiny. Ah, the similarities in painting and writing; thank you for sharing. I am getting better at visualizing and then writing. Inspiration helps, and I always get it here. I've missed visiting; such beauty! Mama Shujaa, welcome back! I have missed you too. I thought you'd appreciate the link between art and writing.